When I last left you all, we had just finished touring the VERY large Sandals Grande Riviera Beach and Villa Golf Resort, and were headed to our last tour of the day, Sandals Royal Plantation. Fortunately this resort was all of 10 minutes from Grande Riviera, so we arrived before we even had a chance to get comfortable. Sandals Royal Plantation is steeped in European influence and is the ONLY All-Butler/All-Suite resort in the Sandals/Beaches family of properties. 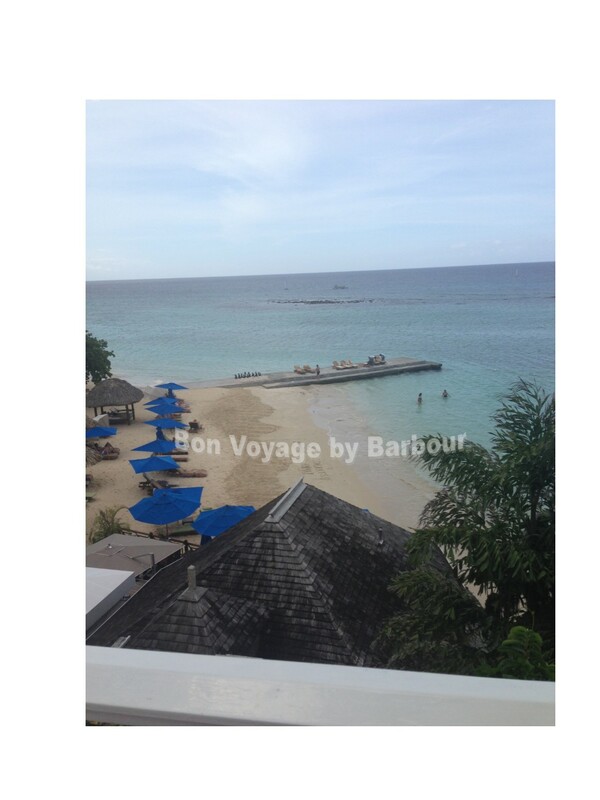 It’s located cliffside with gorgeous views of the Caribbean Sea available from EVERY suite on property. 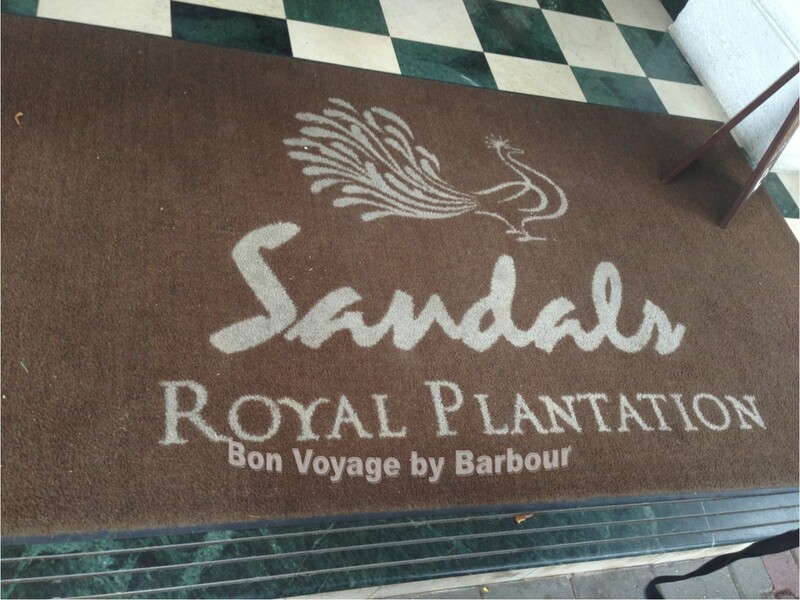 In other words, if you are looking to be pampered in an upscale setting, this would be the Sandals property for you. Disclaimer: my camera decided it was done touring before I was, so the photos from this property are not very impressive. My apologies! When we pulled up to the front entrance of the resort, we were greeted by the most adorable family of peacocks, including some baby chicks. They were the cutest, seriously. Our tour guide took us to the dining areas and bars of the resort (six and two, respectively), then out to the back terrace to take in the incredible view available to the resort guests. Off to our left was a staircase down to the two private cove beaches and to our right, the resort pool. Accommodations: The resort houses 74 suites in 8 different categories. As previously mentioned, all of the accommodations are oceanfront and are serviced by a Butler. We had a chance to see a Coconut Grove Plantation Oceanfront Suite and a Royal One Bedroom Estate Oceanfront Suite (with a separate bedroom and marble master bath). Those who are looking for the ultimate in privacy can book the Villa Plantana, a 3 bedroom villa with its own pool located on a secluded beach. Dining: Royal Plantation has 6 onsite restaurants – Le Papillion (French), The Terrace, Tea Terrace, Royal Grill, The Wobbly Peacock Pub, and C-Bar (additional cost). Guests are also eligible for in-suite dining and room service, which can be coordinated through your Butler. 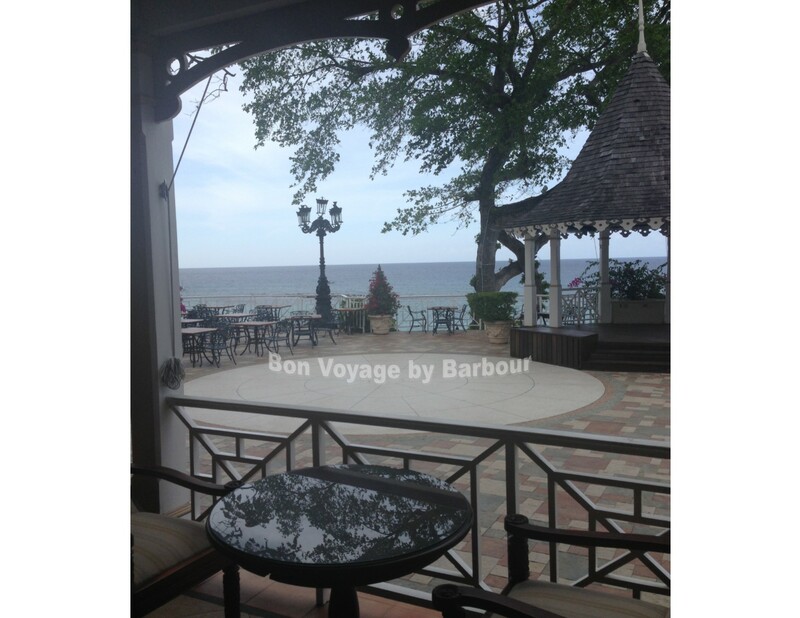 Guests also have access to the 15 restaurant at Sandals Grande Riviera, thanks to exchange privileges with the resort. Pools/Beach: The main pool at Royal Plantation is more modest than some of the larger resorts, which I attribute to the intimacy of the property and the large amount of beach real estate available. There are two private cove beaches 25 feet below the resort – one dedicated to sunbathing, the other to watersports. Guests also have access to the Ochi Beach Club at Sandals Grande Riviera. Atmosphere/Extras: Classy. Refined. Elegant. These are all of the terms that come to mind when I think back on my visit to this resort. ; they have a daily English afternoon tea for guests, for example. Guests have access to unlimited rounds of golf and included greens fees at the nearby Sandals Golf & Country Club. You can “stay at one, play at two” in exchange with Sandals Grande Riviera, with a free shuttle available to take you back and forth. I would recommend this resort to the discerning couple who prefers the finer things in life. Although there are activities at this resort, there is no booming nightlife or theater onsite for nightly entertainment. Guests staying at Royal Plantation will relax, unwind, and enjoy being served by some of the best Butlers around. Previous Previous post: Why IATA?